This chicken recipe is now one of my family favorites. 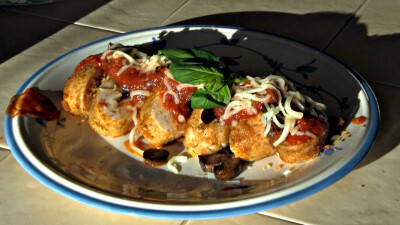 The sauce and the breading do a wonderful job of complimenting the flavors of the chicken and the mushrooms. Let's start by making a marinara or red sauce for the chicken. Place the following into your blender. Blend the contents on high for 10 seconds then pour the sauce into a medium sauce pan. 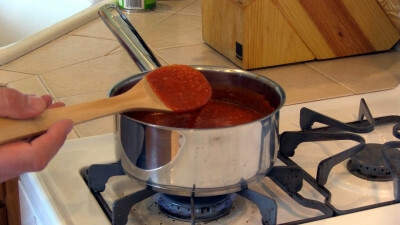 Place the sauce pan over medium high heat until it comes to a simmer. Reduce the heat to low and continue to simmer (stirring occasionally) for 10 minutes. This will allow the flavors to meld nicely together. Remove from the heat and cover for use later. In a large skillet over medium high heat add 4 Tbsp. extra virgin alive oil. Once the oil starts to shimmer add the following. 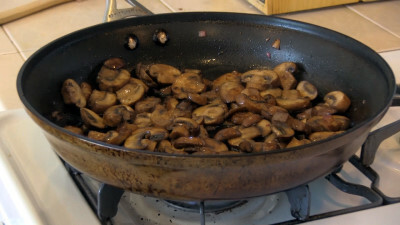 Sauté the mushrooms until they become soft. Cover and remove from the heat for later use. The breading is our next task. Mix the following in a shallow casserole dish. Now it's time to prep the chicken. Trim and rinse 4 - 5 medium boneless skinless chicken breasts. Place a breast on your cutting board on a sturdy surface. 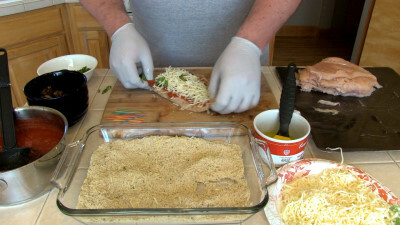 Lay a piece of plastic wrap over the top of the chicken breast. Using the flat end of a meat tenderizing mallet, pound out the chicken breast until its thickness is uniformly 1/4" thick. Repeat this to the remaining breasts. 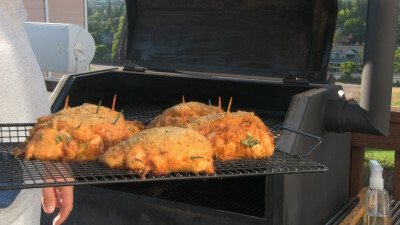 Once all the breasts have been pounded out it's a great time to pre heat your cooker to 260 degrees F.
Using a basting brush, apply a light coat of extra virgin olive oil to both sides of a chicken breast. 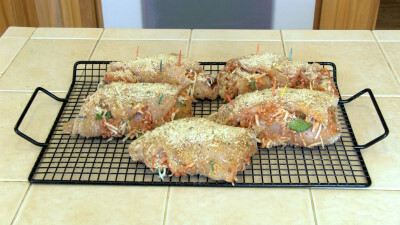 Place the breast into the breading and liberally coat each side. Once coated lay the breast back onto a clean cutting board. Apply a liberal coat of marinara sauce. Spoon on some mushrooms near the widest end of the breast. I used about six to eight mushrooms per breast. This is dependent on the size of the mushrooms. Apply a layer of shredded Mozzarella cheese and drop on a few cilantro leaves to your liking. Carefully roll up the chicken around the mushrooms starting from the widest end. 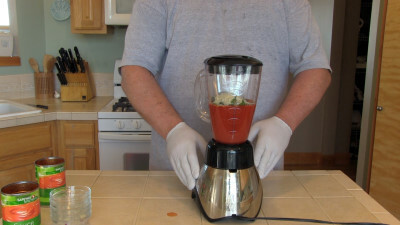 Roll it up loosely and be careful not to force out all of the sauce. Some will come out but that's OK. Once rolled up pin the roll closed with two to three tooth picks. Repeat this process on the remaining chicken breasts. Placing each roll on a greased smoking rack to be placed into your cooker. Once they are all on the rack shake some of the left over breading on top of each chicken roll. Once your cooker has reached cooking temperature (260 degrees) Wipe down and oil the grates. Place the chicken in the center of the cooking chamber and allow the chicken to cook until it reaches an internal temp of 168 - 170 degrees. For food safety reasons I hold off inserting a temp probe until the meat is at minimum 140 degrees. This would be about 1 hour 15 minutes into the cook. Once the chicken has reached 168 - 170 degrees F, remove it from the cooker and let it rest about 15 minutes. This is a great time to heat up the sauce and mushrooms if they have cooled. Before slicing make sure to remove all tooth picks from the chicken. Using a sharp knife slice the chicken rolls into 1/2" thick rounds. Arrange them on the plates in a cascading manner. Spoon on some more mushrooms followed by some marinara sauce. Sprinkle on some shredded mozzarella cheese. I garnished my plated chicken with a few fresh basil leaves. That's it! Buy now your kitchen ought to be smelling wonderful and you should have a crowd waiting with forks in hand.